Babies and toddlers have very little concept of danger, evidenced by the way they may walk into – or sometimes lunge off of – objects without fear of falling or injury. As important as it is to teach toddlers about eating healthy foods and good manners, it’s also essential that they understand how to avoid harming themselves and how to address danger. Avoiding danger starts with the parent and how the home is arranged. Toddlers do not have the necessary understanding or awareness to keep safe, and need outside assistance. You can start by ensuring that your home is thoroughly toddler-proof. 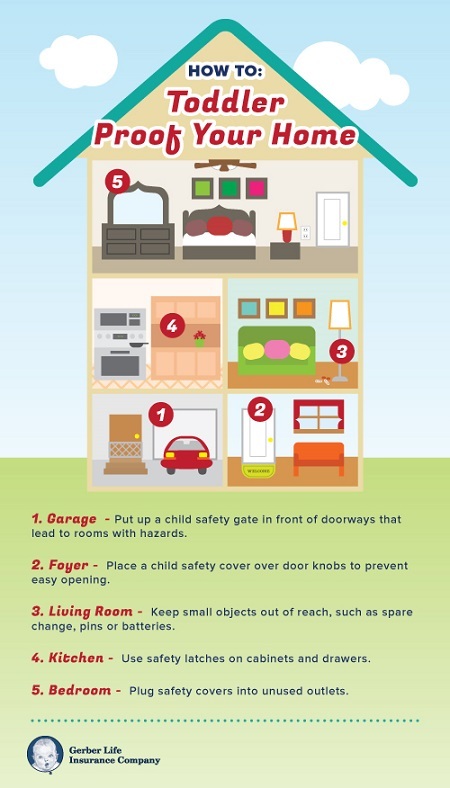 The American Academy of Pediatrics has published a wide range of material to help parents with child safety, including extensive lists for childproofing your home. In addition to making your home safe, be aware of dangers in your environment; never leave toddlers or small children unattended; take necessary precautions when near water; and use proper equipment for sports and other activities. Make safety part of your daily activities, using games and ongoing dialogue as part of your regular routine. Communicating with toddlers about safety is vitally important says Kim Estes, certified prevention educator and founder of Savvy Parents, Safe Kids, in Redmond, WA. By making safety a part of your daily life, toddlers will become aware, without undue fear, of dangers to avoid and simple solutions for how to avoid them. However, don’t just focus on preparation. Be sure to offer your toddler clear and age-appropriate advice for how to deal with danger, and for what he or she should do in a variety of situations. For example, if both of you should become separated in a store, then, tell your child, “Find the nearest store clerk or a police officer and tell him or her you are lost and need help.” At the same time, be sure to point out where to find the clerks and police officers, and what their uniforms look like. Children have increased recall and an affinity for information that’s set to music and rhyme, as well as to seeing favorite characters experience everyday issues. Educational songs, books and other media can help toddlers to understand a danger without living it. Amazon.com has an assortment of books that can help you to teach your toddler about safety. Another great resource is PBS Parents, which has a number of safety tips, activities and resources you can explore or do with your toddler, as well as detailed information about public-television programming that tackles safety themes. Such materials can assist you in teaching your toddler about danger, and can offer an alternate way to start a conversation about what to avoid and strategies for handling the dangers if encountered. Teaching toddlers to be safe doesn’t have to be scary. You can demonstrate safety in the choices you make, and you can share ideas for dealing with dangers in everyday life, just by including your child in the conversation. The more you raise your toddler’s awareness, the easier it will be for him or her to grasp the important issues and respond to them if they occur.